Should I try to handle my car accident claim on my own first? And get an attorney if I’m having problems? Do I have to give the other party’s car insurance company a statement after a car accident? I was just involved in a hit and run car accident. What should I do? If you ever get involved in a car accident where the other party leaves the scene of the car accident, it is important that you take the right steps from the beginning to protect yourself. If you notice that the other person begins leaving the scene of the crash, do not chase after the person. If you chase after the person, you could make a bad situation worse by getting involved in another accident or making the situation more hostile. If you have the right insurance coverage for you and your vehicle, you will still be able to get your car fixed and your bodily injury claim paid for. This is a good opportunity for you to check your car insurance policy now to review whether you carry uninsured motorist coverage and/or collision coverage. If you have collision coverage, you will be able to get your car fixed after paying your deductible. If you have uninsured motorist coverage for bodily injury, your insurance carrier will pay you for your bodily injury claim. If you have uninsured motorist coverage for property damage, your insurance carrier will pay you for the damage to your car. If you do not have the proper coverage for a hit and run claim, it is important that you get the other party’s license plate so that you can pursue a claim against the other party. However, we believe you could make a bad situation much worse by chasing after the person. We suggest that you try to remember as much detail about the other person’s vehicle without chasing them down. Write it down as soon as possible and report the collision to the policy. The police may be able to find the other party involved without you chasing them in hot pursuit. You should also take out your phone as soon as possible to try to take photos of the other person’s vehicle, so long as it is safe to do so. If there are any witnesses present, make sure to get their name and number and find out what they saw. These witnesses may be able to help you prove what happened and find out who the other person was. Always make sure to report the hit and run collision as soon as possible to the police. Your insurance carrier may not provide you with uninsured motorist coverage if your hit and run accident was not reported to the police. 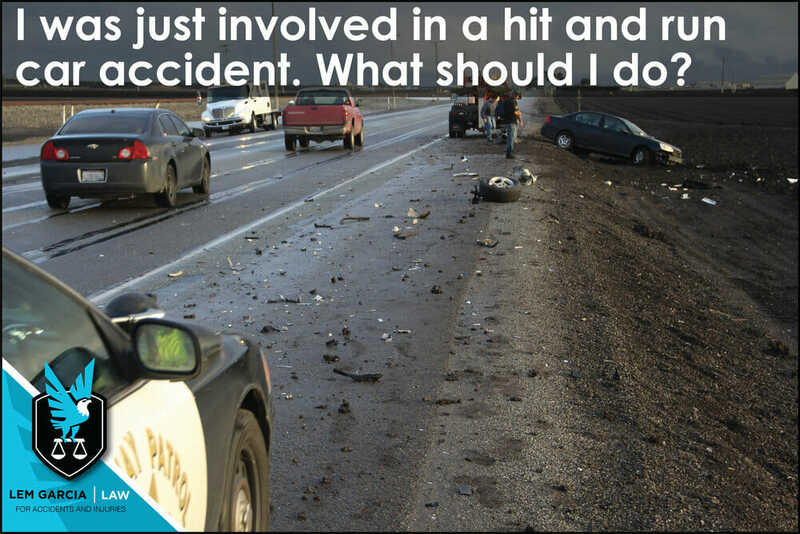 These are just a few tips about what to do if you’re involved in a hit and run accident. To find out more, call West Covina car accident lawyer, Lem Garcia, for a free case consultation. We have handled numerous hit and run cases with excellent results for our clients. We are happy to help you in this time of need.